I guess she set me straight. But having spent a whole lot of time in hospitals over the past three years, I can tell you there is a secondary reason for people to go to hospitals. That reason has to do with food. There are two things you can do with hospital food. You can either eat it, or you can ignore it. I have spent most of my hospital incarceration time in the act of ignoring food. And I mean that completely. I remember back in January of 2013 (my first major hospital adventure), when an excited hospital employee informed me that I had lost a grand total of 100 pounds while lying in the hospital’s bed. They were so proud of me. I thought this was somewhat amusing, considering that the hospital’s dietician regularly came to my room and angrily told me I needed to eat something or they were going to put a feeding tube down my throat, and force-feed me some kind of nutritional glop. The hospital’s personnel were apparently not on the same page when it came to my eating habits. Eventually we reached a compromise. The dietician sent four bottles per day of a dietary supplement named Ensure to my room, which I was to consume instead of food. Fluffy took most of it home, although I occasionally drank a bottle just to be sociable. But Fluffy eventually started bringing food from home. The most successful food he brought was Jell-O. I could eat several bites of that at a time. But he tried heroically to get me to eat something else. At my request, he brought barbecued ribs. He brought fish sticks. But it didn’t matter whether he appealed to my adult tastes or my childhood memories — it didn’t work. I just wasn’t going to eat. The strong drugs I was taking had killed my taste buds to the point that only Jell-O tasted passible. I spent three months not eating food in the hospital. I just couldn’t do it. So a year later, when I ended up in a hospital for a few days, I fully expected I would eat the food. Surprise! Not a bite of food passed my lips. This time, however, there was a reason. The people at the Loudoun County Hospital informed me that I was diabetic, so I was going to be put on a diabetic diet. My diet would include no salt, no sugar, and no fat. Leaving out those three essential food groups also means the food has no taste. If the food doesn’t taste good, I’m not going to eat it. Food just isn’t that important to me that I’m going to eat it if it doesn’t taste good. Sorry. Nutrition just isn’t enough of an incentive. I informed the people at the hospital that I am not diabetic. They took my blood and checked. Surprise! My blood sugar was normal every time they pricked my finger. That did not deter them. As long as their all-knowing computers showed that I was diabetic, then by golly their records were going to trump the actual evidence every time. I was only in the hospital three or four days. For three or four days, I did not eat. A couple of months later, I was in the hospital again — this time for another two or three days. Once again, their records showed that I was a diabetic. Once again, the blood tests came back normal every time. Once again, no amount of pleading on my part won over the dietician. Once again, I did not eat. I spent four days in that same hospital this past July, once again masquerading as an unwilling diabetic. I liked the nurses and the doctors in the hospital. I liked everything about the hospital except the whole diabetes experience. Call me a whiner, but I do not like being called a diabetic when I am not. I do not like spending four days without food. I want to be treated as an adult. I want to eat what I want to eat. Then, in October, I found myself getting sick in Delaware. The closest hospital was Reston Hospital — a place that had been highly recommended by friends — so we thought we’d try it out. One of the things we discovered when I was put in my room was a menu — an actual menu, just like the ones in restaurants. It had food items on it that I might actually eat. This was an exciting thing to contemplate. The people at the Reston Hospital were not aware that I was ordering my first hospital food ever. They may have thought I was ordering food for an army, though. I soon learned which entrees would serve two persons, and always ordered one of those entrees for Fluffy and me to share. I got awfully tired of pizza and quesadillas and build-your-own sandwiches, but those were the big entrée items. I’d order one of those and two cookies, and Fluffy and I were good to go for lunch or dinner. Life was sweet. I was finally living on hospital food, and was happy with my lot in life. And the fact that Fluffy and I were sharing meals meant we even saved on grocery money while I was incarcerated. 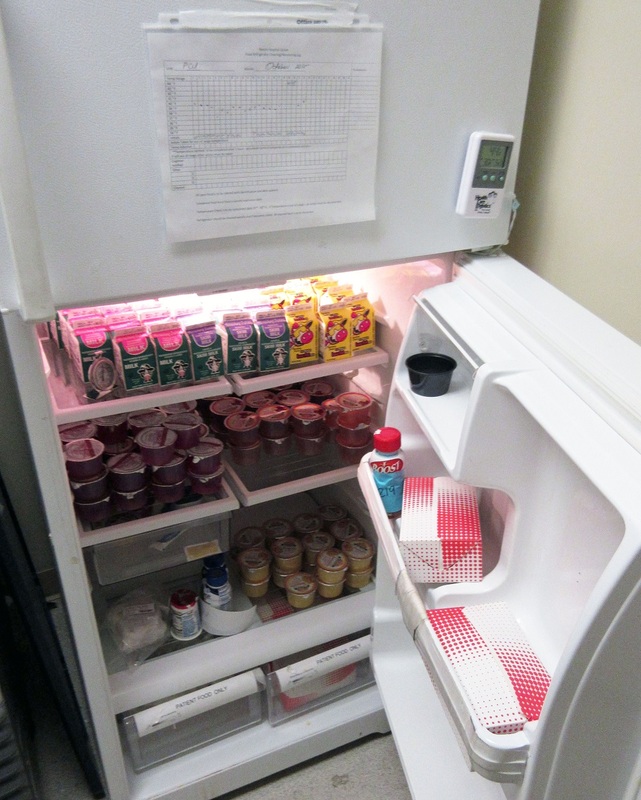 Fluffy also found the break room where they kept an entire refrigerator full of food that patients could request. So we could have extra soft drinks, juices, and ice cream cups whenever we wanted them. Food-wise, this was almost as good as being on a cruise. In addition to meal service, the Reston Hospital even had a refrigerator of treats. But then disaster struck. One of the doctors gave me a drug that threw my heart out of rhythm, and a cardiologist came into the picture. He announced that my heart was beating as high as 150 beats per minute. This was not good. I’m a smart cookie. I knew changes had to be made. I immediately stopped drinking the little six-ounce Coca-Colas from the refrigerator in favor of ginger ale. I was only drinking one a day, but I knew I did not need even that much caffeine. I don’t like to act like an adult, but I can when I have to, so I did what needed to be done. But nooo. This was not enough, apparently. The next time I called down for dinner, the conversation went somewhat like this. “And you can’t have mayonnaise and mustard. “And you can’t have cheese. “Well then, it sounds like I’m not eating, doesn’t it?” And I must admit I slammed down the phone hard enough that the poor lady at the other end probably had an earache for the rest of the day. This particular hospital has a “hospitalist,” who is a doctor who oversees the care of all the patients. Let’s just say she was in my room within fifteen minutes, and the dietary order was overturned within a half hour. But by then I was angry enough that we got takeout twice that day. Fluffy brought Mexican food in for lunch and Subway sandwiches in for dinner. “Heart healthy” my left foot! Nobody tells Kathy, queen of the universe, what she can or cannot eat. By the time a person is sixty-five years old, she should be able to decide whether she wants to eat butter or margarine with her food, and whether that food is a biscuit or an English muffin. But we went through this same song and dance when I was hospitalized again the following week, and we had to have the hospitalist overturn the cardiologist’s heart-healthy diet prescription. You know, I just don’t think that being on a heart healthy diet, or a low sodium diet or whatever stupid diet the hospital wants to put you on is going to make a big difference in your life expectancy. Well, maybe if you really are a diabetic, you’ll want to stay away from sugar. But if you really are a diabetic, you know what sugar does to you and you’re going to be smart enough to police yourself. The average hospital stay is a whopping 4.8 days. Is eating margarine instead of butter for 4.8 days really going to affect your overall health? Call me a cynic, but I can’t believe it’s going to make a life-changing difference. If there is any one doctrine that is the foundation of Mormonism, it is the concept of free will. We believe we were put on the earth to learn to choose between good and evil. As much as God wants us to choose the good, He will still respect our right to make the wrong choice. We learn freedom of choice as small children. The concept is hardwired in us, so that a three-year-old will be happier with his coloring of a landscape if the sky is the green he chose rather than the blue his mother put in his hand with a gentle reminder that the sky is blue, not green. The way we grow to maturity is to learn from our mistakes. If we make the wrong choices today, we may choose the right tomorrow. And if we continue to make the wrong choices, we will suffer the consequences of our actions until it may eventually dawn on us that our suffering is the result of our own poor decisions. Of course, we can only learn from our mistakes if we are given the freedom to make those mistakes in the first place. When people try to tie our hands and take our freedoms away from us — even if those freedoms are as frivolous as choosing whether we can have a pickle with our sandwich at lunch — we do not take it kindly. It is not the pickle that is important. It is the freedom to choose the pickle that symbolizes everything. As I lay in the hospital bed, I realized that I had very few choices that were under my control. I could not choose when to be awake or when to sleep. The moment I drifted off, someone invariably came into the room to draw blood or otherwise bother me. As the nurse pointedly told me, I was not there to rest and recuperate and get well. I was there to take medicine. I could not choose to be fully dressed. My underwear and my modesty had taken flight before I ever entered the hospital room. I could not even choose whether to lie on my back or lie on my side. The air mattress dictated that I lie on my back at all times. It was not uncomfortable (indeed, it was a $100,000 bed, so it darn well should have been comfortable), but for nine days in a row and for the additional three days afterwards, I reclined in one position and one position only. What could I do? I could choose whether to read or watch television, and if I watched TV I could choose the station. I could choose to be grouchy or to be cheerful. I chose to be cheerful, and from what the nurses told me, this was a decision that many patients did not elect. And most of the time, I could choose to have a pickle with my ham sandwich, which was on a sub roll, served with mayonnaise and mustard and a slice of cheese. When I couldn’t make that little choice, it upset me. Big time. Next time you’re tempted to make an arbitrary rule affecting what somebody else — your child, your student, your patient, or somebody who works for you — can do, please remember this. It’s not just the pickle. Freedom of choice is important to human beings. It’s hardwired into us.